There are a lot of nuances like this when it comes to evaluating gear. If you’ve run into something that seems completely unexpected, this post should help explain why that suggestion is the smart thing to do. All of Mr. Robot’s gear suggestions adhere to your current Heart of Azeroth level, by default. Sometimes this causes unexpected things to happen, but they are smart, unexpected things. Best in Bags: a lower iLevel Azerite item can be better than a higher version until your Heart of Azeroth level is increased. This is exactly what you want to see and you should follow the recommendations. Upgrade Finder: you might see a Mythic Uldir Azerite item rank lower than a Heroic one (or Heroic compared to Normal, etc). This is correct if your Heart of Azeroth level isn’t high enough to unlock more powers. However, you might want to see what Azerite items will be upgrades, assuming you can unlock all of the powers, because eventually, you will. You can change your Heart of Azeroth level to see a ranked list based on a max necklace (see instructions below). Gear Check: the ranked item lists also follow the Heart of Azeroth level restriction. A menu pops up that lets you edit your talents and other character information. Look for the Heart of Azeroth level on the left, edit it, and click the green ‘save’ button on the bottom right. 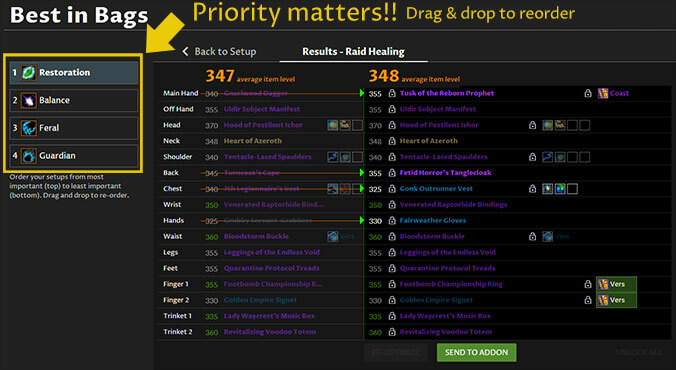 If you’ve done Best in Bags and had an off-spec Azerite Power, trinket, or gem/enchant recommended, it’s likely you need to rearrange your spec priority. The top spec gets first shot at all of the best gear, Azerite Powers, gems and enchants. Let’s say your top spec is a Resto Druid and your second spec is Balance. You have two Azerite helms in your bags, a 370 and a 355. Your healer spec takes the 370 and picks healing Azerite Powers. Your Balance spec then has to decide: is it better to equip the 370 helm with healer powers, or use the 355 with Balance powers? Mr. Robot evaluates those two options and picks the best one for the Balance gear set, all based on simulations that he’s done for you. It seems odd, but sometimes the best option is that 370 with healer powers. The same process happens when gems and enchants are picked for a higher priority spec: the lower priority specs can’t change them. 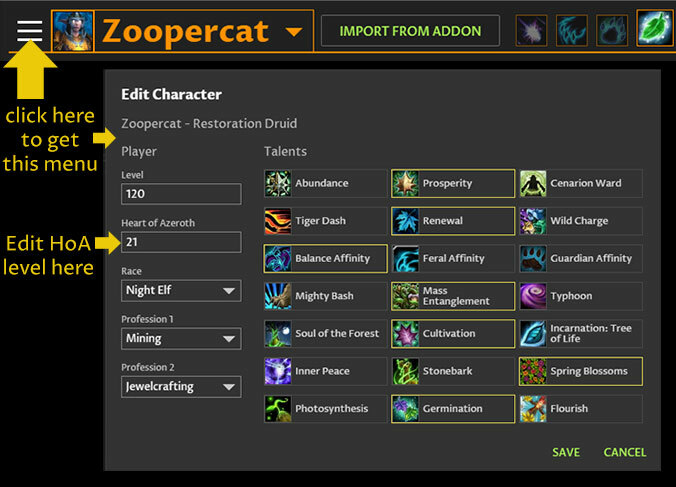 This priority system keeps you from going broke by constantly switching Azerite Powers, gems (etc) on an item shared between specs. If you want to override Mr. Robot, you can lock in any Azerite Power, gem or enchant by clicking the lock icon next to them. The Reorigination Array buff gives you +75 of your highest secondary stat, and that can stack up to 10 times. Balancing the effect of this buff is right up Mr. Robot’s alley. First, he makes sure your best secondary stat is the highest one. To ensure that, he might suggest a lower level item to raise your best stat or reduce another one. This often happens on rings, which don’t have primary stats – so lowering the iLevel isn’t as big of a deal. Next, he also considers your stat balance with this buff. Let’s say Crit is your best stat, but it’s ideal to have Mastery around 2/3rds the amount of Crit (for the best stat balance). Well, once you get the Reorigination Array buff on Crit, it will dramatically raise the amount of crit you have, throwing your Crit:Mastery balance off. So Mr. Robot will increase your Mastery to get it much closer to your Crit amount without the buff, so that when you have the buff, it ends up being a 2:3 ratio. This kind of stat and gear juggling is where Best in Bags really shines: Mr. Robot looks at ALL of your gear (yep, every single combination possible), and picks gear for you based on simulation data custom to your character. Because of this, you might see unexpected gear suggestions in Best in Bags, but he’s just being super smart, promise. You can turn the Reorigination Array buff on or off (it only works in Uldir), on the setup step. Speaking of Best in Bags, there’s another nuance worth looking at. It’s possible you get a new, high iLevel weapon (for example) that seems like it is an upgrade, but Mr. Robot doesn’t suggest it. All of the stats are higher on the new weapon, so you’re left wondering why you wouldn’t equip it. 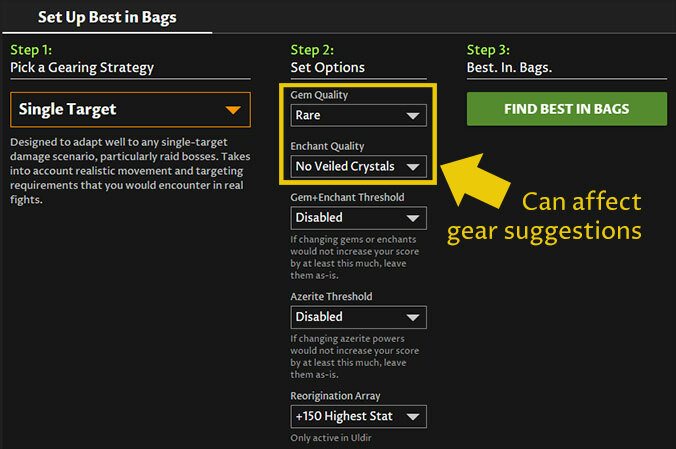 If that happens, check your enchant quality setting in step 2 of the setup screen. Mr. Robot is bound by the rules you set, and that affects his gear recommendations. Let’s say you normally don’t have the gold to spend on expensive enchants, so you set the Enchant Quality to “No Veiled Crystals.” But in your raid, a generous guild mate gives you a weapon enchant. You get excited, your eyes start watering from the sheer joy of raiding with great people, and you enchant your weapon. Then in that raid, a 355 weapon drops – a 15 iLevel upgrade. You do Best in Bags and Mr. Robot says, “Nope, keep the 340 equipped.” He’s not wrong, but it also might not be what you want. You see, Mr. Robot was told not to put expensive enchants on new gear, which includes the weapon enchant. That forces him to compare your 340+epic enchant to the 355 un-enchanted weapon. It’s quite possible that enchant makes the 340 better, something that Mr. Robot will figure out for you. 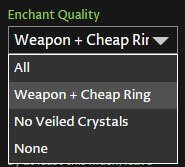 When you are ready to put an enchant on it, change that setting to “All” or “Weapon + Cheap Ring” enchants. Then you’ll see him recommend your new, shiny, higher iLevel weapon. This can happen with gear that has sockets as well. You can change the gem setting on the setup screen too, right under the enchant options. If you see an orange lock icon, that indicates an item has been manually locked in. That means Mr. Robot has to use it, and because of this, you might see your score go down or you might see a ranked list with better items listed above it. To unlock the item, click the orange lock icon, or click ‘unlock all’ below the gear table. There is one lock situation that is not correct: sometimes you might see some unrelated item locked in, like a fishing pole in your head slot. I’ve seen a handful of cases where this happens, but haven’t been able to figure out why, or how (our best guess so far is that Mr. Robot had too much bubbly at the party… no one really knows how much it takes to get him drunk). If this happens to you, stop by our forums and give us as much information as possible. To fix it, just unlock that item and it will no longer be there. Recently, you may have seen Mr. Robot suggesting things for tanks that made him seem like he’s off his rocker. While it was technically correct, it wasn’t what people actually wanted, so we’ve updated Mr. Robot’s algorithms so he is more compatible with our human expectations. You choose a tankiness threshold, which tells Mr. Robot how tough you want to be. Mr. Robot does everything in his power to get you to your toughness goal. Once you reach that goal, he’ll focus on increasing your DPS as much as possible. Yellowfive, our Tank Theorycrafter, wrote an article that fully explains the new tank gear optimizations. Your gear was so low for the content you were optimizing for, that nothing helped you live. The boss hit so hard, you’d still get one-shot even after mitigation. When this happened, Mr. Robot would tell you to equip lower iLevel gear. Why?! Well, it’s actually funny: he saw that if you put on lower iLevel gear, you’d die faster, saving the healers’ mana (way to be a team player!). While he was theoretically correct, we reprogrammed our helpful little robot to not do that… because that was taking ‘Team Player’ a little too far. Another situation you might have seen also related to being undergeared. While you could live (just barely), the tankiness tradeoff to get more DPS was so skewed in DPS’s favor, that he’d push you in that direction. While he’s very good at finding the tradeoff between tankiness and DPS (via the ‘blender’ setting that you picked), this was happening even on all-toughness settings. The math was correct, but it’s not the intent, so we updated this too.